Steel Authority of India is recruiting for post of Nurse for the year 2015. 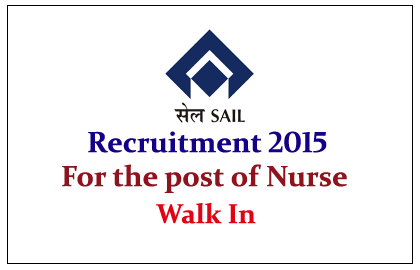 Interested and Eligible candidate can attend Walk In on 14th May 2015. Bokaro Steel Plant - the fourth integrated plant in the Public Sector - started taking shape in 1965 in collaboration with the Soviet Union. It was originally incorporated as a limited company on 29th January 1964, and was later merged with SAIL, first as a subsidiary and then as a unit, through the Public Sector Iron & Steel Companies (Restructuring & Miscellaneous Provisions) Act 1978. The construction work started on 6th April 1968. Eligible candidates can attend the interview on 14 / 05 / 2015. For more details kindly check official Notification.